philosdev needed a new coded website design and created a contest on 99designs. A logo (JPEG, GIF, PNG, or other popular bitmap formats) and template (HTML + CSS) for philoscafe.com. white or very light colored background, blues, pale yellow. logo lettering red or black. I like the look and feel of sitepoint.com, 37signals.com, and digg.com. However, such styles would need to be adapted for what I described above. Philoscafe.com will serve as a site for the discussion of interesting philosophical questions. This "virtual cafe" is inspired by the CafÃ© Philos, or "Philosophy Cafes," that originated in Paris, France. There will be a community blog and discussion forums. I am looking for a site design that is "modern"-looking ("Web 2.0" - simple, clean), but with a touch of "Old World." The layout and color scheme can be very simple. A light background with blue div's would work. Use a serif font for the logo. 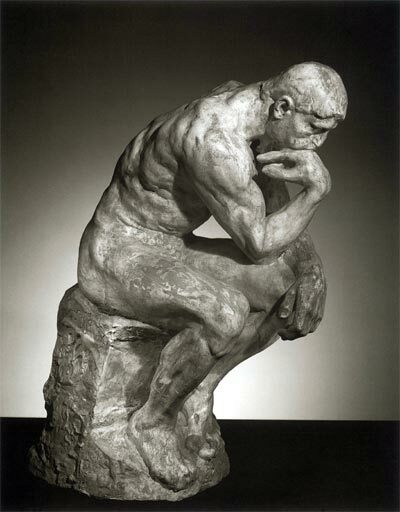 I would like a graphic, such as an image of Rodin's "Thinker" wearing a beret, next to the letters. It can be as simple as a photo of the famous statue, with the beret drawn and pasted on his head. I'm open to other creative suggestions, and I'm flexible if you have interesting ideas for graphics. Note that the url is philoscafe.com (without the accent), but I would like to see the French spelling of "CafÃ©" in the logo. The deliverables should include standards-compliant, clean-looking CSS+HTML and graphics for the logo. Nice side profile of "The Thinker"
Thanks, and if there are any questions, please don't hesitate to comment.